No review for this? Going to review this now. Never seen Himouto! Umaru-chan first? Then this will be weird. Himouto! Umaru-chanS is a series of shorts that manages to tell a pretty good story in the amount of time, sure it's kind of rushed but it is a two minute short after all. Anyway, in these amount of "shorts" every girl in Umaru-chan! has a chibi sprite as Ebina, Umaru, Kirie and Sylphinford venture off into a different universe learning different tasks as random stuff happens, like a zombie invasion. Sure it's random but it's well paced unlike other shorts I've seen, it doesn't drag on and on about the same thing, it doesn't feel like it's going on forever. The story, art and voice cast are all amazing like the series it is from and it doesn't feel like a different thing from Himouto! Umaru-chan! Now that the good things are out of the way, let's talk about the girls. Ebina, Umaru, Kirie and Sylphinford don't honestly feel like they were from Umaru-chan. 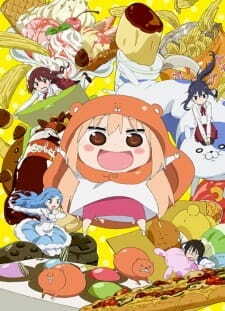 Besides Kirie, Umaru doesn't really balance well with the other characters, she doesn't feel like a best friend or a rival to both Sylphinford and Ebina, honestly, a show just about Kirie and Umaru wouldn't be bad, but when its a show about all the girls, it just seems that the other two are out of place and shouldn't really be there. Also they feel even more dull here then in the series, which you should kind of already expect but they just feel a little more boring then normal, which a shame. If you're bored one day, watch all of these shorts where we see the characters be themselves without Taihei in the way? Watch these shorts, you will be in love with them! I actually enjoyed this a lot more than the main series. Really short bite sized eps that I chained half of em in one sitting. Nothing much to it in terms of story, just a good laugh. Hard to rate the story when there is none, and that is just fine.